Free Demo Migration Available. You may easily check out the service in action running a free Demo Migration. Data2CRM transfers a limited amount of default data, like accounts, leads, contacts, users, tasks, etc to your dream CRM. So in a split moments you’ll be able to evaluate the process of migration. Robust Migration Wizard. 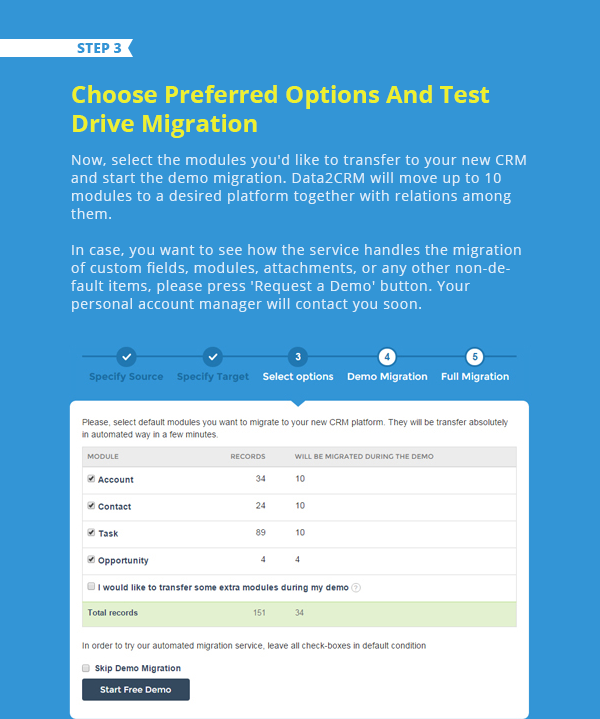 CRM data migration is literary reduced to a few mouse clicks in the migration wizard. All you need to do is provide your Source and Target CRM platforms. No Business Interruption. Data2CRM does not influence on your business processes. Both platforms will be working properly during the data transfer. Complete Safety Guaranteed. You shouldn’t worry about your data security, Data2CRM just copies information and retrieves into a new platform. Initially, install Data2CRM application to your Bitrix24 account. Specify your source CRM you’d like to migrate from. Now, you may start the free Demo Migration. In case, you’d like to migrate default data like accounts, contacts, leads, deals, tasks, users to Bitrix24, press ‘Start Free Demo’. Data2CRM will transfer limited amount of data so you could see the service in action. 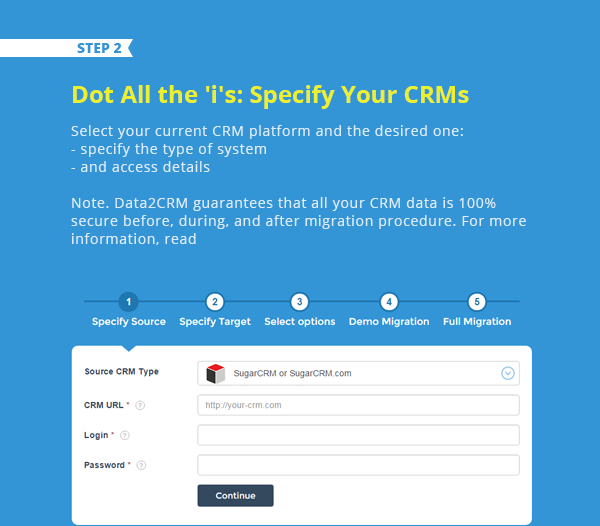 If you want to check out how Data2CRM handles the migration of records like attachments, notes, ect., please select ‘’Request a Demo” option and the pro team will migrate all the specified data for you. 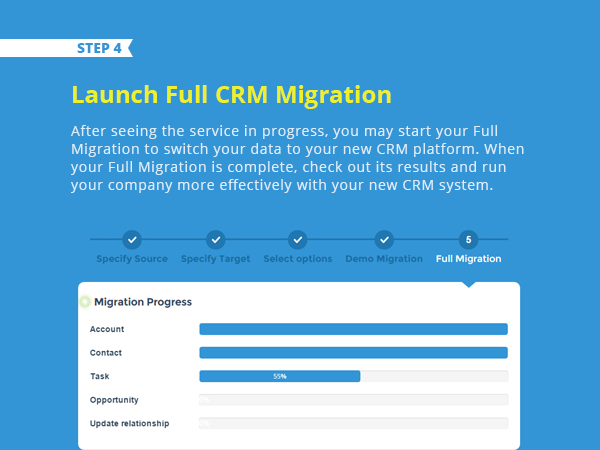 If you are satisfied with the Demo Migration results, you may start Full Migration to your new CRM platform. 1. Register your Data2CRM account. 2. Provide your source CRM access details. 3. Specify target Bitrix24 credentials. 4. Start free Demo Migration. Data2CRM will transfer a limited amount of records to Bitrix24 for you to see how service works in action. 5. Press 'Start Full Migraiton' to migrate all records to a new Birtix24 CRM. After that, you’ll be redirected to our Migration Wizard. Register there your account: provide your name, email, and choose password. Specify your source CRM you’d like to migrate from and target Bitrix24 platform.